On Saturday I held an 80th birthday party for Bob here at our apartment. We had two tents set up in the back lawn with tables. It was a beautiful sunny day. About thirty family members and friends attended. Our menu was shrimp and cocktail sauce, ham, speidies and Italian bread, scalloped potatoes, baked beans, corn casserole, cabbage salad and macaroni salad (Thanks to my daughter Michelle), relish tray, cheese and crackers and veggies and dips. The cake was courtesy of his sister Nancy. She asked what color was his favorite and he said purple. Be careful what you wish for. Slideshow at KODAK Gallery Lois Ann sent the pictures yesterday. Now I can get back to sewing. 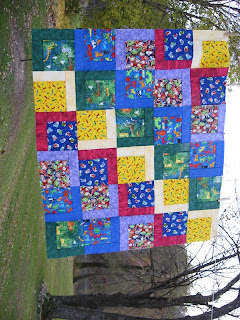 I should finish a baby quilt for a shower on Saturday. 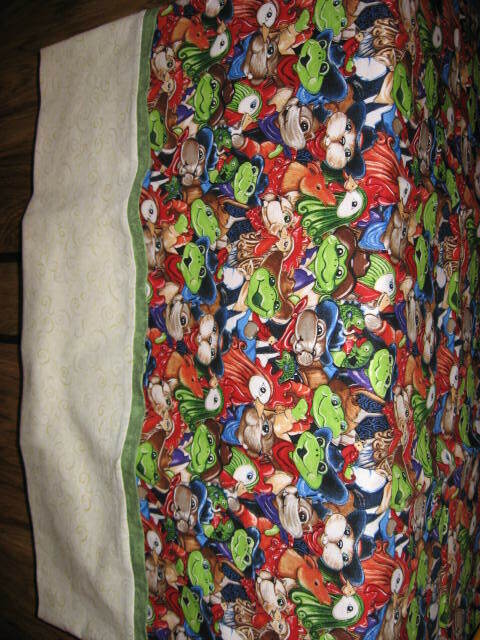 The top is done, now to sandwich and quilt, bind and finished. Granddaughter Becki is expecting a boy on June 20 which is her Father's birthday. Recently I've been having fun sewing those Disappearing Four Patch blocks that Billie Lauder accidentally created. I met Billie at the Lancaster Show and bought the book Quick Tricks Squared, page 24. Our Triangle Guild members liked the blocks and asked me to teach them at our next program. Easy peasy!!! Our water was shut off today at 9:30 a.m. for an upgrade. I got 2 loads of laundry done and a shower before that time. My brother Bruce came to the party Saturday and said he'd had quite a day already. His daughter and son in law brought his lawnmower back. When Mike was unloading the mower from the truck, he got a bit carried away and backed it into Bruce's pond. Bruce said the look on Mike's face was something to see. Tammy said she's looking for a tiny riding mower to put in her fish tank. Guess I'd better check my pictures more closely before I post them. 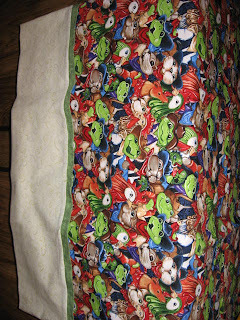 The top is Block Party and the pillowcase was made from leftovers of Hoppity and Friends. We don't really have sideways trees here. I've made this top several times. In this one I used 6 1/2" squares with a 2 1/2" x 6 1/2" rectangle and a 2 1/2" x 8 1/2" rectangle. This top took about 2 nights to assemble. The sun just poked thru the fog. Yippee!!!! Yesterday I potted my geraniums. Last fall I yanked the plants out of their pots and put them in brown paper grocery sacks. They went to live in my daughter's cellar. Usually I get them out and pot up about March 1. The plants have some nice green shoots on them. After they get started growing I trim back the dead stems. There were even a couple of blooms on the plants. They didn't get any water during the winter. Amazing. Now to plant my mesculan lettuce in a planter. Last summer (cool and wet) I had lettuce all summer.